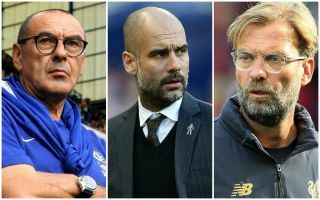 Leading pundit Stan Collymore has picked a pretty weird top four for the season and insists he’s ‘comfy’ sticking with it as his prediction for 2018/19. The former Liverpool, Aston Villa and Nottingham Forest man is known for being an outspoken personality, and has already got into one or two arguments on Twitter tonight as he offered his followers a half-hour Q&A session. See below as Collymore answered a fan who quizzed him on his prediction for this season’s top four. Okay, Manchester City winning the Premier League – fine. Liverpool as their closest challengers in second place – fine. But this dysfunctional Manchester United side third? This horribly off-form signing-shy Tottenham fourth? Where are Chelsea? The Blues have made a superb start under new manager Maurizio Sarri, winning all five of their opening five in the league, plus a victory in the Europa League on Thursday. Chelsea to slip out of the top four despite superb start under Maurizio Sarri? Sarri has Chelsea looking confident again, with Eden Hazard and Jorginho looking on another level – and let’s not forget this is also a pretty similar squad to the one that were crowned champions just under a year and a half ago. Maybe this CFC outfit aren’t good enough to continue as they have done, but tipping them to not even make the top four is very bold indeed, and one we’ll have to keep an eye on to remind Stan of at the end of the season!